National Geographic's Finland and Northern Scandinavia Adventure Map is designed to meet the unique needs of adventure travelers with its detailed and accurate information. Cities and towns are easy to find in the user-friendly index. Motorways, expressways, and other roads are clearly designated and include distance in kilometers so travelers can easily plan their best route. Specialty content such as hundreds of diverse and unique recreational, ecological, cultural, and historical destinations make Adventure Maps the perfect companion to a guidebook. National parks, castles, churches, campsites, winter sports resorts, archeological sites, museums, and scenic viewpoints are among the sites noted to help you take advantage of the region's many natural attractions and activities. The southern half of the region is shown on the front side of the map spanning from Finland's southern tip to the city of Rovaniemi in the north. Sweden's eastern coast is included from the city of Umea north to Jokkmokk. The reverse side of the map covers the northern half of the region from Norway's island of Vega north to the far reaches of its Norwegian and Barents Sea coasts. Northern Sweden is shown from Hemavan to the country's northern borders with Norway and Finland. The northern portion of Finland is included from Salla to the border with Norway. Every Adventure Map is printed on durable synthetic paper, making them waterproof, tear-resistant and tough - capable of withstanding the rigors of international travel. Road map of Finland and northern Scandinavia with legend, city and places of interest index. On reverse map and index continued. Waterproof and tear-resistant. Renowned for over 100 years for their clear, accurate and easy-to-read mapping, Michelin country maps give travelers an overall picture of their route, with practical road and travel information; and city maps containing extensive street indexes orient them quickly so they can find their way to their destination. National Geographic's wall map of Scandinavia is one of the largest and most detailed maps of the region. The signature Classic style design uses a bright, easy-to-read color palette. This map features thousands of place names, accurate political boundaries, national parks, and major infrastructure networks such as roads, superhighways, airports, canals, ferry routes, and high-speed and passenger railroads. The region's diverse terrain is detailed through accurate shaded relief, coastal bathymetry, and symbolism for water features and other land forms. Elevations of major peaks and depth soundings are expressed in meters. Inset maps provide detail of Iceland, the Faroe Islands, and Jan Mayen. In addition to Norway, Sweden, and Finland, coverage includes Denmark, Lithuania, Latvia, Estonia, and Kaliningrad Oblast. 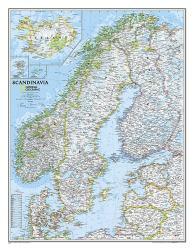 National Geographic's wall map of Scandinavia is one of the largest and most detailed maps of the region. The signature Classic style design uses a bright, easy-to-read color palette. This map features thousands of place names, accurate political boundaries, national parks, and major infrastructure networks such as roads, superhighways, airports, canals, ferry routes, and high-speed and passenger railroads. The region's diverse terrain is detailed through accurate shaded relief, coastal bathymetry, and symbolism for water features and other land forms. Elevations of major peaks and depth soundings are expressed in meters. Inset maps provide detail of Iceland, the Faroe Islands, and Jan Mayen. 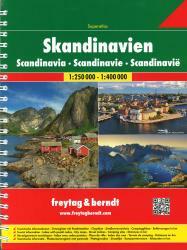 In addition to Norway, Sweden, and Finland, coverage includes Denmark, Lithuania, Latvia, Estonia, and Kaliningrad Oblast. .
Spiral-bound atlas of Scandinavia covering Norway, Denmark, Sweden, Finland, the Benelux and norther Germany at a scale of 1:250,000-400,000. Small parts of the adjacent countries are also covered. Details combines clear road mapping with subtle hillshading and peak heights. Eight different types of roads are shown, with clearly marked road names, distances between junctions, gradients, service stations, parkings and motels. Toll roads, border crossings and scenic & tourists routes are also indicated. Railways, ferry lines, and national & provincial boundaries are marked alongside national parks and military areas. Also a series of symbols depicts places of interest, viewpoints, airports & harbours, campings, archeological sites and mountain huts. Following the main mapping is an extensive index with postal codes, and 33 street plans of major town centres at 1:15,000 with corresponding indexes. All Legends are in 8 different languages including English. . Wondering what to read when visiting Scandinavia?